Even in the hottest fighting days on the Kursk Bulge in the summer of 1943, when German troops have lost their strike force and hoped for a breakthrough of the Soviet defense, the Soviet command began to develop operations under the code name «Suvorov», whose aim was the defeating of the German Army Group «Center «main forces. 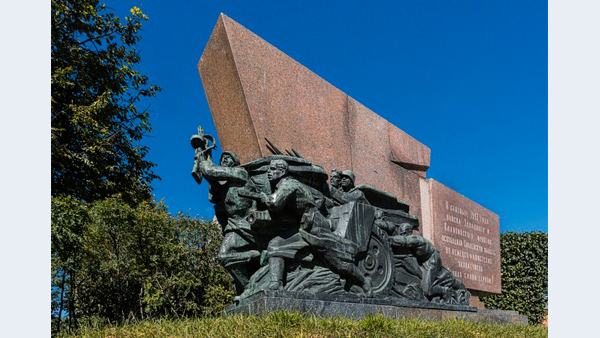 As a part of this operation, which began in August 7 and will ended on October 2, in the last days of September 1943, the units of the Soviet Kalinin and Western Fronts continued to develop the attack in the west direction, and the immediate aim was the Smolensk liberation. In September, 21 the Kalinin Front parts captured the Demidov city, creating thus a serious threat for the enemy troops from the north of Smolensk. Taking into account the current situation, the Germans began to withdraw their troops. Going ahead, the compounds of the Kalinin Front reached the line of the Kasplya river in 10 kilometers to north of Smolensk by the September 24. The Western Front parts in September 24 broke through the Sozh river, covering the German troops placed in the Smolensk region, from the south. The Nazis were half-encircled. By the evening of the 24th the forward units of Soviet troops entered the immediate approaches to Smolensk. The German command understood clearly the strategic and political significance of Smolensk and tried to strengthen the grouping the way they could, to defend the city. But in this situation the Germans just physically could not do anything to stop the Soviet forces. Impact of our parts could not be stopped. The fierce assault on the city started. At 2.30 am in September, 25 the city’s north-eastern edge was seized by 331th Infantry Division parts under the commanding of Colonel Berestov. Soon, in the city broke fighters of 82nd, 133rd and 215th divisions, and at 6 am in Smolensk there were eight infantry divisions. At night, under the freezing rain, the forward battalions of 331th Division under the command of L.A. Romanov and P.F. Klepach broke from the flax combine area to the left bank of the Dnieper. The soldiers were ordered to hoist the red flag over one of the remaining high-rise buildings in the downtown area. Without getting involved in minor skirmishes with the survivors Nazis, who were barricaded in houses, Soviet troops broke through to the Smirnov square to the «Smolensk» hotel, which was although mined by the Nazis, but as a result of the rapid advance of our troops it was not blown up. A memorial sign in honor to the Smolensk and Smolensk region liberation in September — December 1943 is the subject of cultural heritage (the monument of history and culture) of regional importance.